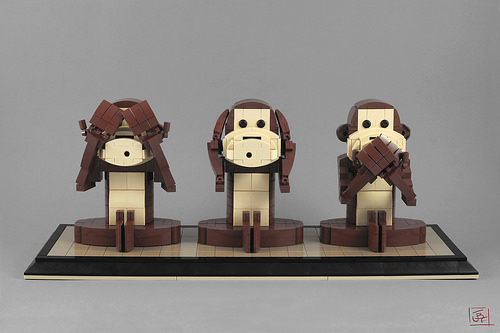 Mizaru, Kikazaru and Iwazaru, the three wise monkeys (or three mystic apes as they are also known) represent the Japanese Buddhist proverb that reminds us to avoid evil and not to spread it. Jimmy Fortel went for the classic interpretation, although some other versions include a fourth monkey that adds an additional message to the proverb. The build uses simple colours and shapes, focusing on the message of the build instead of advanced techniques, even though there is still some nice part usage with the rubber pegs for eyes.